Pioneer DJ released the original DDJ-SX back in 2012 followed by the DDJ-SX2 in 2014. These two previous versions are loved by Serato DJ users around the world. The 4 channel layout, medium format size, rugged build and instinctive layout made the SX and SX2 extremely popular for professional DJs in the mobile and club night sectors. Read on to see if the Pioneer DDJ-SX3 follows this mantra. With Serato DJ Pro now available, Pioneer DJ have aimed the SX3 at DJs who want to take their sets further and make use of the latest features – this approach gives DJs fresh ways of delivering their set – so if you’re rocking a bar, wedding or corporate event the Pioneer DDJ-SX3 has killer features you will want to use straight away. Dual USB ports – You can now connect two DJ’s running Serato DJ Pro at the same time. 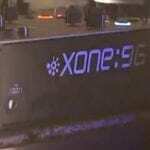 This allows seamless DJ changeovers, back to back sets or the ability to run a backup system for peace of mind. 3 Microphone inputs – Pioneer have added a third mic input on the DDJ-SX3 with connection and control at the front of the unit. This is in addition to the existing mic inputs at the rear of the unit. This means you can have a microphone in use without affecting the 4 main channels. Microphone control – The DDJ-SX3 includes a software control panel for all three mic channels. Within this, you can add reverb and compression to the microphone inputs as well as an option to low cut the mics. These additional features mean the DDJ-SX3 performs effortlessly alongside singers, MC’s and spoken word applications without the need for using additional devices. Sound colour FX – The DDJ-SX3 now has 4 built-in colour FX including Filter, Echo, Jet and Noise. These can also be assigned to the two main mic channels. Deep integration with Serato DJ Pro – RGB performance pads now change colour to reflect each of the 11 pad modes including Hot Cues, Samples and pitch play. The pads will change immediately when each of the pad modes are selected and their playing status. Library Selection – You can use the library scroller on either of the laptops connected to the DDJ-SX3. Pitch ’n Time DJ – The DDJ-SX3 includes a Pitch ’n Time DJ voucher enabling the use of Key Shift, Key Sync and Pitch Play. This trifecta of features means you can use pitch to mix your tracks harmonically. Key shift is the adjustment of the tracks by semitone, whilst pitch play lets you trigger hot cues in a range of different keys. With these assigned to the pads you can play your cue points like a keyboard. 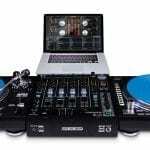 In summary, the Pioneer DDJ-SX3 has kept with the same form factor as the popular DDJ-SX2; the layout and high quality build is still present with the DDJ-SX3. The new features like dual USBs and additional mic connection/control adds more useful features to the Swiss Army knife of Pioneer DJ controllers. The Pioneer DDJ-SX3 will be available in early June is available NOW priced at £969 and can be ordered here.